Argyll Etkin sold an attractive selection of colour trials as well as a rare essay in their auction on 4th October 2013. 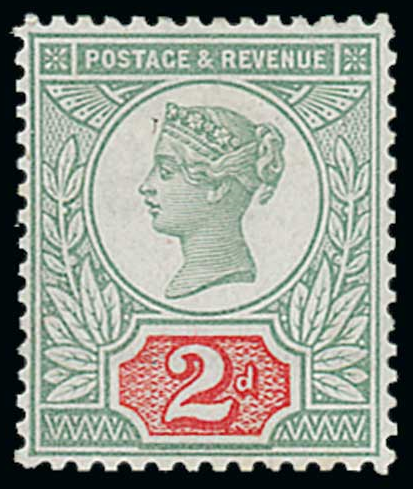 The sale featured not only many colour trials of the 1883-84 Lilac & Green issue (which were made in preparation for what became the Jubilee issue), but colour trials of the 2d duty plate, 4 1/2d duty plate colour trials and 10d., as well as some proofs, panes, inverted watermarks and covers. However the highlight of the auction was lot 478, the 2d green and scarlet with the speckled engine-turned background on the duty tablet. 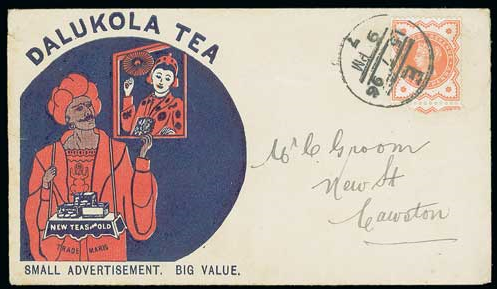 This essay for the duty tablet was almost immediately rejected and most of the examples printed were destroyed, and was stated in the auction catalogue to be one of the rarest of all the Jubilee stamps. Catalogued at £12’500 by Stanley Gibbons, I wouldn’t be surprised if I saw this come up on their inventory in the near future. It sold for £6’000 plus 17% buyers premium.